Douglas-Michel Butterfly Plants is dedicated to providing quality Asclepias or milkweed seeds that are essential for the survival of the Monarch butterfly. Milkweeds are host plants for Monarch butterflies; i.e. milkweed is the plant the Monarchs use for egg laying. The egg hatches after three days and begins to eat the milkweed leaves which provide the needed nutrition and protection for the caterpillars. Eventually the caterpillar becomes a chrysalis, (sometimes confused with a cocoon, which is for a moth), and then eventually emerges as a beautiful monarch butterfly. 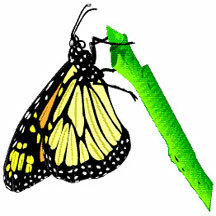 The whole life cycle of the Monarch butterfly; is therefore, interdependent on the availability of milkweed. So much so, that the Monarch butterfly, as a species, cannot survive without milkweed. Douglas Michel Butterflyplants specializes in providing the seeds for milkweeds, including Asclepias curassavica "Silky Gold", "Silky Deep Red" and "Red Butterfly", Asclepias speciosa "Showy milkweed", Asclepias fruticosa "Swan Plant" and Asclepias physocarpa "Blowfish tree". All of our seeds are PESTICIDE FREE. We do not provide Monarch butterfly eggs or caterpillars. We are located 3.5 miles west of Aromas , California in Monterey County, the agriculture belt of the Central Coast. Our farm is on 3.5 acres overlooking Watsonville, California, 6 miles west of Aromas. You may purchase Douglas-Michel milkweed seed packets from Natural Bridges State Park Visitors' Center in Santa Cruz, California. Your purchase at this location serves to support the fine work that they do in preserving the environment.